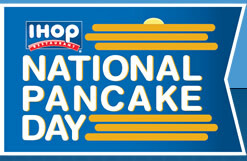 FREE short stack of Buttermilk pancakes. Yum! In return for the free pancakes, guests will be asked to consider leaving a donation for Children's Miracle Network Hospitals© or other designated local charities.